Some 100 members of Ethiopia's opposition Semayawi (Blue) party were arrested and some badly beaten over the weekend, the party says. Party chairman Yilekal Getachew said equipment such as sound systems were confiscated ahead of a rally on Sunday which was banned. Communication Minister Shimeles Kemal denied there had been a crackdown. The government said the venue had already been booked by a pro-government group condemning religious extremism. The governing EPRDF maintains strict control over public life in Ethiopia. 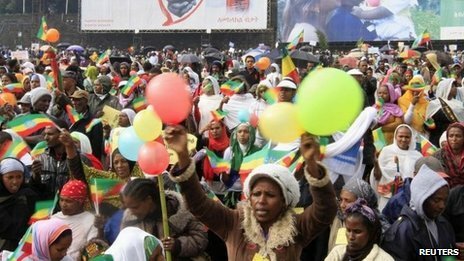 The public protest Semayawi organised in June was the first major demonstration on the streets of Addis Ababa since 2005 when hundreds of protesters were killed in violence. It was called to demand the release of jailed journalists and activists. The rally planned for Sunday was to call for political reforms. Mr Shimeles said that any group which wanted to organise a public protest had to seek a permit. He said the authorities could not refuse to grant a permit but could insist that the event be held at a different time or place to that requested. Hailemariam Desalegn took office as prime minister a year ago, following the death of long-time leader Meles Zenawi.